Ali Maman is a farmer and gardener. He lives with his three wives, Hadiza, Habiba and Nanuwa, five children, and six grandchildren in the village of Kabori, Zinder Region, in Niger. But after years of struggle, Winrock International’s Multiple-Use Water Services (or MUS) Project, financed by USAID and the Coca Cola Foundation, helped to turn Ali’s limited garden into a year-round steady source of income. At first, Ali volunteered to demonstrate a manually drilled borehole and low-cost treadle pump for irrigation on his plot as one of the projects’ first demonstration farmers. The technologies were installed by Winrock trained drillers and pump manufacturers based in Matameye, a town just 30 kilometers away. The low-cost treadle pump uses man-power to suction anywhere from 4,000 to 6,000 liters of water per hour from a depth of 10 meters, allowing Ali to access the plentiful shallow ground water more efficiently than he did using his traditional garden well. canals. Before learning how to build the canals, Ali had carried water from his traditional well to each individual plant. This laborious method of irrigation severely limited the area that Ali could cultivate. Since installing the treadle pump, Ali has doubled the size of his garden. 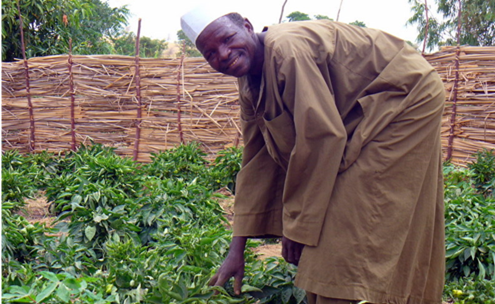 Four months later, during the rainy season, Ali harvested his first ever crop of peppers. In Niger, the rainy season is traditionally reserved for field crops, like millet and beans. The months of July and August, in particular, are known to local farmers as “the hungry season,” because they must wait for these crops to mature. During these months, Ali can now not only provide better nutrition for his family, but he can also sell his crop of peppers at a premium. But Ali did not stop there. After attending a training the MUS project gave on high-value crops, Ali planted a quarter of his garden with cabbage, lettuce and onions, three crops he had never grown before. Ali also planted his first moringa trees. Moringa is a small tree that produces leaves high in vitamin A all year round. Ali has continued to make improvements and innovate after his initial success. Less than one year after Ali’s initial partnership with Winrock, Ali and his sons dug a 100m2 fish pond next to his garden as part of a small pilot project on rural fish production. Winrock provided technical guidance, 6000 improved catfish fingerlings, and a first installment of local fish food made of bran, blood, and peanuts. For his latest project, Ali invested in a small motor pump so that he could more quickly irrigate his growing garden and new fish pond. He still uses his treadle pump when the motor pump is broken or when he has no money for petrol. While Ali had problems getting enough water to irrigate his garden, his wife Hadiza had problems getting enough water for their family to drink, cook, bathe, wash clothes, and water their sheep and goats. Ali’s wife Nanuwa at their local rope pump. Kabori’s traditional well is a sandy 10-minute walk from the village. Hadiza often found herself rushing to bring home enough water in the evening. And while water from Kabori’s traditional well is plentiful, it also carries contaminates that can cause illness and disease. The ropes used to pull up water drag mud into the well, and the excreta of livestock, watered just meters away, drain into it. locally maintained. The user simply turns a wheel a water is drawn up by pistons attached to a loop of rope from depths of up to 35 meters. Now, Hadiza can get clean, safe water for drinking, washing and cooking any time of day just 100 meters from her house. Like all the other married women in the village, she contributes about five cents per week to the upkeep of the pump. After these pumps were installed the village requested Winrock’s assistance in upgrading their traditional well for use as a livestock watering point. At first glance, the water problems of Ali and Hadiza, and the solutions brought by the MUS project, seem separate. In fact, they are closely related in at least two ways. 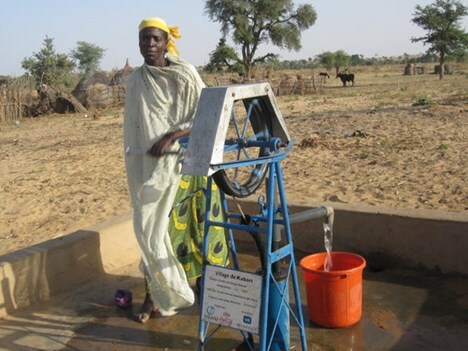 First, if Ali’s treadle pump were the only source of pumped water in the village, it is likely that Ali and Hadiza would prefer to carry this clear water home rather than drink the tan water that comes from the traditional well. Despite the water’s clarity, it could be contaminated by the fertilizers and pesticides used in the garden or by the garden-well water that Ali uses to prime the pump. Secondly, the solutions are related because the extra money that Ali and other gardeners like him earn with their treadle pumps will help maintain and improve village infrastructure, including the rope pump. Winrock hopes that in the future, Kabori, and other villages like it, will invest in rope pumps and boreholes, without project assistance. “We can improve our lives, that’s why we like this project. You help us at first and we can continue to improve. That makes us happy,” said Ali.